The 2018 deer season in southwest Georgia has been a weird one. After Hurricane Michael devastated our communities (and hunting lands) back in October, most southwest Georgians have been a little pre-occupied with things more important than chasing a four legged critter around the woods. Couple that with the odd weather patterns and it’s no wonder the hunting has been slow. If your woods survived the hurricane, odds are you have been cleaning up around the house on the weekends and may have just recently had a chance to sit in the deer stand. So far in 2018, I’ve been deer hunting seven times. I’ve hunted in the mornings and afternoons. I’ve sat on food plots, field edges and in hardwoods. I’ve hunted over feeders, acorns, and all sorts of green forage that’s supposed to attract every deer within 100 miles. And I’ve seen a grand total of 5 deer. Those deer were all together and came out directly under my stand 10 minutes before dark. To confound my simple mind even more, my trail cameras have dried up too. On a feeder where we usually get 200 pictures of deer, I had one. One picture of three does. Under a feeder that’s been slinging corn for two years. As the sun rises in December, so do the chances of seeing that big buck. If your deer was displaced as a result of Hurricane Michael, he’s been working hard to get his life back in order. His yard is a mess and he lost all of the food he’d been eating. His home was destroyed and his normal routine was completely disrupted. But that was almost two months ago. He’s back in his old bed or he’s found a new one he likes. He’s found the food, even if it is not where he was eating before. 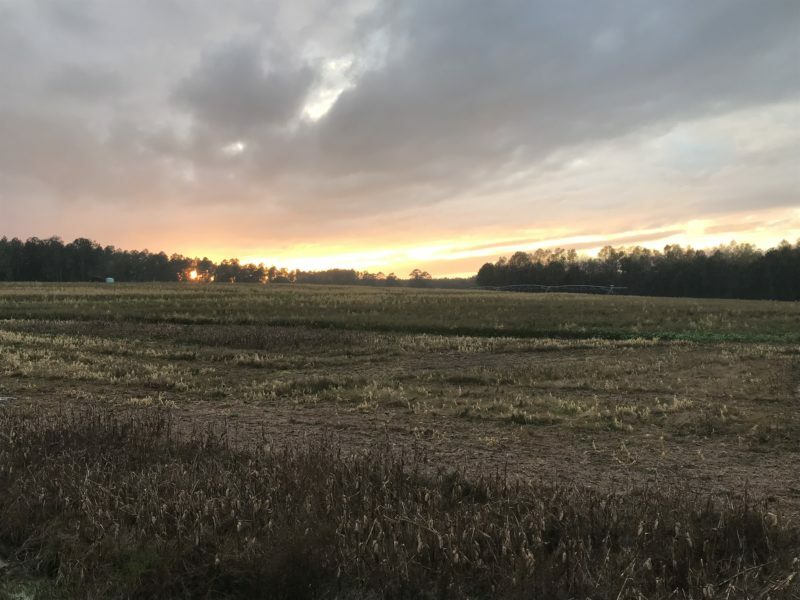 As the calendar flips to December, most farmers have harvested their fields. Those oak bottoms are drying up too. Deer are like men – they are slaves to their stomachs and their natural urges. Since the food sources are tightening up, expect the deer to become a bit easier to pattern. Those food plots should become a bit more reliable in the late afternoons. And the travel routes from there to the bedding areas ought to be hot in the mornings. And “Ol Big Boy” is ready to do what big bucks do this time of year – chase does. That brings me to my next point…. If you aren’t seeing scrapes yet, don’t feel bad – I’m not either. But there is one thing I’m confident of – “Ol Big Boy” is going to be looking for love soon. And it won’t be long before the does are ready – it’s a fact of nature. And the rut is when anything can happen. Nevermind that it’s 80 degrees and raining – when the bucks are chasing, all logic goes out the window. In southwest Georgia, depending on where you hunt, the rut is typically anytime between now and Christmas. In some counties, the week after Christmas is traditionally when it kicks off. But if you look at the weather and the moon (two things deer hunters plan their lives around), you’ll see that the weather is turning cold and the moon is waning. The next full moon is December 22. With decent weather between now and then, the deer will be moving during the day more. The weather should start to level out this week, bringing seasonal temperatures behind this rain we’ve been having. So what am I saying? I’m telling you that the rut will kick off for most of southwest Georgia in the next few weeks. The big boys will be on their feet and the does will be hitting your foodplots. As the old song goes, “It’s the most wonderful time of year”. Post Script: If you’re one of those whose hunting has been great and whose deer have already been chasing for two weeks now, keep it to yourself! For those of us who have suffered through the 2018 deer season, there is still hope with each December sunrise.